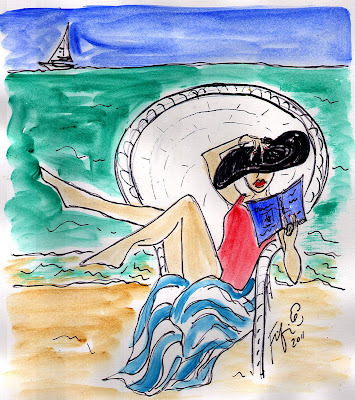 Reading on the beach would be FABuLOUS, non? Speaking of READING... Don't forget to visit Reading is Fashionable this week... MORE GIVEAWAY!!! AUTHOR INTERVIEWS!!! BOOK REVIEWS!!! annnnnd FUN!!! I can think of a few books I'd toss into a suitcase right now for a trip to the beach. When can we leave? I want to be "That Girl"!!! Yes it would be nice to sit and read on the beach right now but got too many things to do. I will have to get cracked on and get my jobs done. Wouldn't that be a lovely place to be? Love your art. That's me! Love the painting!